THIS Leinster club senior football championship semi-final defeat in Pearse Park, Longford will hurt. It is never easy to take losing a game of this stature, but when the team collectively fails to perform and a number of players let themselves and their team-mates down, then the pain is intensified. Last year at the same venue the two sides met. The home team were convincing winners. Éire Óg had a case in 2017 when they said they had only a week to prepare after their county final replay win. This time they had no such issues. 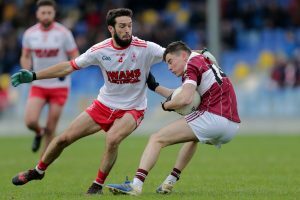 All seemed to be going well when they had a confidence-building Leinster first-round win over Newtown Blues in Louth and they had no injury worries. For 20 minutes on Sunday, Éire Óg and St Columba’s matched each other. It took seven minutes for the home side to open the scoring. With both sides getting their players behind the ball it wasn’t that surprising it was a defender, Donal McElligott, who found the posts after an interchange of passes with David McGivney. Chris Blake equalised for the YIs and it looked as if a close game was in prospect. Bit by bit the Mullinalaghta parish side got on top. With Brendan Fox, McGivney and Rian Brady all pointing, they gradually put a modicum of distance between themselves and their rivals. Coming towards the break Éire Óg did create a number of half chances for goals, but instead of taking easy scores they went for three-pointers and failed to breach a sticky defence. At the other end McGivney converted a free and Gary Rogers added another point. The game was getting away from Éire Óg as added time was being played. Then disaster struck when the Carlow side lost possession. As Ross Dunphy fell to the ground he could clearly be seen throwing a left hook in the direction of a defender. No doubt the Mullinalaghta player made the most of it. It was an easy decision for the match officials and Dunphy walked. With 14 players and trailing by 0-6 to 0-1 at half-time away from home, the game was up. A 33rd-minute point from Darragh O’Brien did nothing more than strengthen home resolve. Three unanswered points from St Columba’s meant their opponents needed a goal. That never looked like coming. O’ Brien’s 41st-minute point completed Éire Óg’s miserly total of 0-3 on the day. From there St Columba’s lorded it in most areas around the field. Having picked up a yellow in the first half, Chris Blake walked for a second offence on 48 minutes. The first Mullinalaghta goal was coming. James McGivney still had it all to do when he took possession on the right about 12 meters out. Showing good composure he picked his spot in the bottom left-hand corner of the net and Robbie Moore had no chance. From that point, misery upon misery was heaped on Éire Óg. 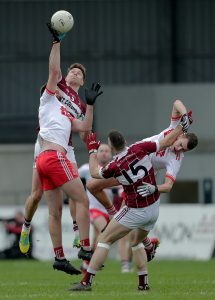 When Moore and Aidan McElligott competed for a high ball on the edge of the small square, it was the corner forward who did best when his neat flick ended up in the back of the net. Something clearly upset the Éire Óg goalkeeper and whatever it was he took it out on the goal scorer. Again, it was an easy decision for the referee Anthony Nolan to show the red card and Éire Óg were down to a dozen players. The crowd were streaming out by that stage. It was a matter of getting out of there as fast as they could. A disappointing end to a good season. What doesn’t kill you can only make you stronger. That is what Éire Óg will be hoping for anyway. Meanwhile, a little club with a population of around 400 is set to face the mighty Kilmacud Crokes in a provincial decider. Who says there is no romance in sport? All Carlow people will surely wish them well. St Columba’s: Patrick Rogers; Simon Cadam, Patrick Fox, Conan Brady; Francis Mulligan, Shane Mulligan, Donal McElligott (0-2); David McGivney (0-4, 0-3 frees), John Keegan (0-2); Gary Rogers (0-1), James McGivney (1-0), Brendan Fox (0-2); Jayson Matthews (0-1), Rian Brady (0-3), Aidan McElligott (1-0). Subs: Conor McElligott for A. McElligott (52 mins), Michael Cunningham for Brady (54 mins), Luke Meehan for Mulligan (58 mins), Cian McElligott for Matthews (60 mins). Éire Óg: Robbie Moore; Fiach O’Toole, Mark Fitzgerald, Benny Kavanagh; Jordan Lowry, Paul McElligott, Jordan Morrissey; Murtough Ware, Kelvin Chatten; Sean Gannon, Simon Rea, Eoghan Ruth; Ross Dunphy, Darragh O’Brien (0-2), Chris Blake (0-1). Subs: Mark Furey for Morrissey (35 mins), Richie Mahon for Lowry (39 mins), Derek Hayden for Rea (41 mins), Gerry McGill for Ware (52 mins).